We’re very excited about the upcoming release of “Ek Ladki Ko Dekha Toh Aisa Laga” directed by Shelly Chopra Dhar, and starring Sonam Kapoor, Rajkummar Rao and Anil Kapoor in what is billed a “coming-of-age queer romantic comedy-drama.” Sonam portrays Sweety Chaudhary,who rejects all attempts by her Punjabi family to find her a husband because she is secretly in love with Kuku, played by Regina Cassandra. While the trailer is quite subtle, (spoiler alert!) 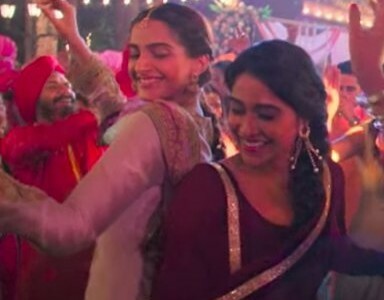 Sonam’s character is expected to come out to her family and receive their acceptance—which is a very positive sign. Sonam has been a consistent champion of LGBT rights in India and came out publicly against India’s Penal Code 377 back in 2014. At our upcoming Desilicious Winter Warmup bash, winners of our Queer Bollywood Trivia Hour will receive free tickets to a screening of the movie. Put your Bollywood trivia hat on and join us next Saturday between 5-6PM (before the dancing goes into full gear). Otherwise, you can join SALGA and Queering Desi opening weekend to see the film. We’re excited about this movie and the soundtrack already looks promising! Get ready to dance to some of the tracks on January 26th at the DL Rooftop.